One size does not fit all! Our liners are designed to fit each of our bins perfectly so there is no messy bag overhang or bunching — and they never slip. Extra-thick plastic and double-seam construction prevent rips and tears. Strong drawstring handles make the liners easy to lift, tie, and carry. A simply perfect bin, with simply perfect bags, which are simply a perfect fit. The liners are great... for fitting the bins, which we also like. What we don't like is that the liners are single-use plastic, not recyclable. Hence the rating. My wife raised this with you a few months ago, and you said you couldn't do anything about it. We feel you could try harder. Thank you for the feedback. We are glad to hear that you are using our custom fit liners! Although our liners are not made from recycled material, all of our liners are made from the same polyethane (PE) plastic. This material is recyclable but we do suggest that you contact your local council to confirm that they accept this in their plastic recycling collection. Currently we do not manufacture biodegradable liners as we want to ensure that the strength, fit and integrity of our liners live up to our exceptional standard and this would be compromised with biodegradable materials. We want to ensure that our liners do not split and are up to the job, especially in our larger bins, and we have decided to offer our standard liners to customers. The liner fits the bin, doesn't leak, and ties well at the top. Excellent product of good quality. Simple Human bin liners fit tight and don't move when rubbish is put in them brilliant. I have bought three products from simple human and i am pleased with all three.On a regular basis the dustbin bags are strong and fit the bin exactly. We have been using these bins for some time now and are very happy with them. Having tried cheaper bags in them we came to the conclusion that simplehuman bags are well worth the money for fit and quality. Bags and bags - again! Always good quality and as usual arrived within 3 days of ordering. I was happy to find a bag that fit the garbage can I bought and held up without splitting or breaking when full. A tight fit to the top of the bin so it doesn't fall in as it fills up, which is a good thing! Simple Human bin liners are amazing. Easy to fit, no leaks (no matter what is put in the bin) always easy to tie closed, no slippage into the bin. Wonderful. Your plastic bags are great, they blow all the others out of the water. Your garbage cans too are beautiful, thanks. i'm very pleased with both of these purchases. Brought a rubbish bin to fit exactly inside under the sink. A bit disappointed at the very tight fit but happy with the products. Ordered a second large batch of bags and they are great -Has somebody made some fine adjustments to the fit as they are now perfect . !!!! Great bins Great bags 100% recommendation Well done superhuman!. SUPER GOOD BAGS. EASY TO USE AND SUPER STRONG! I love the customization of these trash bags. It is so easy to identify which trash can you have by the letter and order exactly what you need! It's practically dumb proof. And fast delivery is great! Thank you for making a great product. Although a little more expensive than your common or garden bin liners...these Code R liners are brilliant at holding a lot of rubbish...they dont leak, hence no mysterious puddles in bottom of wheelie bin when rubbish thrown out. Liners that actually line the trashcan and stay put until you remove them! These are the first liners I've found that stay put and snug to the trash can until you want the bags to come out. It does take a little bit of getting used to the first couple of time to get the liners on. But once you do, you'll love them! Standard grocery bags will fit the the small trashcan I have, but there is nothing like having the bag liner stay on until you're ready to take the trash out. I order extra liners to keep on hand. The liners are also a little thicker ply than you buy in the normal grocery store or home maintenance store like Home Depot or Lowe's. Well worth the little bit of extra that you pay for them; especially if have kids in the house. These bags are easy to use fit perfectly and are very strong too. I should buy stock in simplehuman! We have purchased four simplehuman rectangular cans. They fit perfectly in our bathrooms and beside my husband's recliner. Anyone with a mischievous dog knows that trash cans are prime targets for fun! The R bags fit perfectly in our cans with easy on feature and they "stay put" once installed. 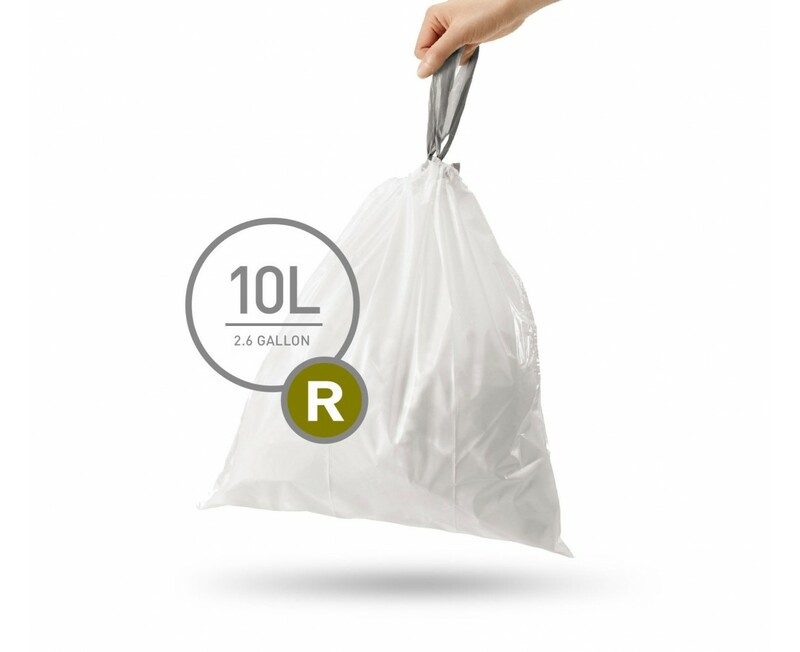 They are thicker than standard bags which provide security from spills. I bought the wrong size. I thought I was purchasing the B bags for my rectangular can and I purchased the bags for the round cans. I am going to keep them and use them anyhow because the bags are just wonderful and so easy to use. I know my bags said B but when I was purchasing it didn't look like the right bag so I purchased a different one. I should have stuck to what I know. We use this in our vintage 1972 airstream. Recently fully restored! Product is a great fit and works well. I had trouble getting the bags on until I realized I needed to pull the top of the bag all the way over the wide part at the top of the waste basket. Once I started getting 3 sides all the way over that wide top, the 4th side went over easily and the bag is plenty deep with that much overhang. A good strong bag that can be tied closed. Works great for me. I have the in-cupboard bin and these liners fit a little too snugly. Unless there is a secret to fitting them, I find it a stretch to fit them. They are strong and you can press the contents down well to get more in. When you come to remove the liner the fun really starts. It's like the liner doesn't want to leave the bin. I don't have this problem with my sensor recycler bin. Thank you for your review, a member of our customer service team has contacted you directly. The bags work EXACTLY as described. They do not sag at all and are very sturdy. Buy them with your can, they are totally worth it. So great and came so fast. They don't sage, bag or break. Thanks so much. Thanks for your review, A Customer Service Agent will reach out to you shortly to help you out. I contacted customer support because the bags were too tight. They sent me a bag of the latest version and they finally fit - yay! Ordered before. Click on code you use. Me, that is R. Will be ordering again. Pros- *These bags are made for this exact trash can. no more saving bad bags from the grocery store with holes in the bottom. Cons: *Plastic is thick. and because they all end up in a landfill, I think they could be a bit thinner and still work fine. *They are almost too tight for the trash can. They are really hard to get on and off. I love these trash can liners. They fit the trash can perfectly, no room for spills over the side. The drawstrings are really sturdy and seal the bag up nicely so that nothing escapes. Great product, well designed and quality materials. These liners fit nicely on the can. The edges do not slip down. The liners are sturdy and the ties work nicely. This trash system is great. These bags fit perfectly, never stretch or threaten to break. I like the drawstring. They used to come in a dispenser box, which I liked, but put my new order into the old box and it's working fine. Overpriced (stores cheaper) bags don't fit! Major struggle toget them on. Thank you for your review, I am sorry to hear that your pack of liners are not suitable. A customer service representative will contact you shortly to assist you further. Only one thing wrong with them. They need to be a fraction bigger round the top. I have a fight to get them onto the rim of the bin and the plastic has to be stretched quite a bit to fit. Otherwise, great product. They were the right size but they are extremely tight to slip over the edge of the insert. The wife cannot get them stretched enough to slip the on and they are too tight for her to get off. some of them leak. Love your product. Bags are really tight. My wife isn't strong enough to stretch then onto the can. Thank you for your review. Our custom fit liners are designed to have a snug fit to prevent bag overhang and slipping. If you prefer a liner with a looser fit, please feel free to call our customer support at 877-988-7770 (Mon-Fri 8am-5pm PST) or e-mail us at [email protected], and an agent will be happy to find another liner that is compatible with your can. The container is attractive and the bags fit!! No mess, no bag breakage .. no fault at all. Perfect system!!! I love the simplehuman bin liners, they are the strongest bags I have had and they beat using carrier bags every time, no tearing or holes that leak moisture to deal with. I'm still trying to perfect a technique of getting the bags over the rim of the bin but once fitted they stay in place until removed. One other thing, I love that there is an order reminder when the box of liners are getting low which saves getting down to the last bag and not a having anymore in reserve. The depth of the liner is fine. However, it is next to impossible to fit the liner around the top of the can. I have ripped the liner trying to get it into place. My wife suffered a stroke, and it is impossible for her to get the liner in place using her one good hand.. Another 1 or 2 inches in circumference for the liner would cure the problem. R code bags are easy to put on and easy to take off. No slipping and spilling from these bags. The carry straps make taking out the trash simple human. Thank you for your feedback. Our custom fit liners are designed for a snug, tailored fit so they stay neatly hidden beneath the lid — no messy bunching or slipping. Please feel free to call us at 877-988-7770 (Mon-Fri 8am-5pm PST) should you ever need help with any of our products. I use the Simplehuman trash container that is installed on the cabinet door below the sink for composting fruits & vegetables. I can empty everything in my compositor & reuse the liners several times before putting them out with the recyclables. They don't leak and fit perfectly. I haven't found any equivalent in the stores, so I bought the bulk 240 pack, which should last quite awhile. Thank you, Simplehuman, for keeping the price reasonable. Love them... Heavy duty and fit perfect! I love them, the bag is strong and holds a lot of trash. Will hold up and not fall apart like other brands. Normally I just used the generic whatever is around trash bags for any of my cans in the house. But, for some reason, I decided to go ahead and buy the right bag for the new can I just got from Simplehuman®. The bags are fine. They are nice and sturdy and have draw pulls to carry to the garbage can when full. I will say, with the bags being nice, the only real feature gained from bags you can buy at the store, is the fact they fit perfectly in the can they were made for. If you are like me and do not like sloppy bag hangover in a visible location then get them. I bought these because they are made for small step can. However, they are extremely difficult to get over the can. They seem to be too small. The quality of this bag is 5 stars. Dropped a star, because the top is so tight, it's difficult to get the bag on and off the insert. Bed Bath and Beyond, where I bought the can, and Amazon both show size C is the bag for my new can. That is incorrect. Only size R works, but it's a tight fit at the top. The rest of the bag is plenty generous, though. The ties are sturdy, as is the thick plastic. I'm also glad to be able to get a large supply, so I don't have to order more than once a year. My bin is not a Simplehuman one but these bag fit it perfectly and they are very durably. My bin size is 25cm diamitre and 28cm High, I was having difficulty finding a bag that was not far to big so thank you Simplehuman. I've got a small Simple Human pedal bin that I use for compost materials. These bags fit perfectly and are incredibly durable. I've tried using plastic shopping bags, but they almost always leak and leave a smelly mess. My only complaint is that I can't find a store in this area that still carries the bags. We've got these trash bags in the cans next to the changing tables throughout our house, and they do a great job of controlling the odors. Definitely worth paying a little bit more for that feature!